I am shaving my head to support The St. Baldricks Foundation and raise money for childhood cancer research. Through a chance connection, I came across a Facebook page called Michael’s Warriors. It was started to share the journey of a 13 year old Las Vegas boy as he battled leukemia. Through that page I became aware of the battles that Michael and too many other pediatric cancer patients fight. Following his story and witnessing the strength of his mother against such odds moved me to try and help. Michael fought an aggressive form of leukemia that is not often seen in pediatric patients, and a chromosomal abnormality interfered with the ability of chemotherapeutic treatments. After a tough 7 month battle, Michael succumbed to his cancer, enduring some of the worst side effects that chemotherapy can have on a young body. His spirit was strong, and his love and concern for his 3 siblings, including a twin brother, was both beautiful and heartbreaking. Why does pediatric cancer research need it’s own funding? There are many factors that make it a separate issue from “adult” cancers. Pediatric cancer research is seriously underfunded, and in 80% of kids, cancer has metastasized by the time it is diagnosed. A child’s body is still developing, organs and bones are growing, so treatment is often vastly different that what an adult needs. Separate pediatric research and drug trials are vital to finding successful treatments, and cures. 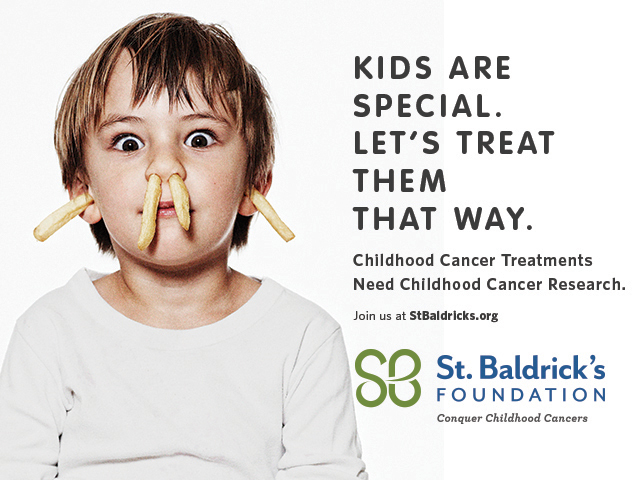 According to the St. Baldrick’s website, “ A recent study shows that because of the treatments they had as kids, by the time they’re 45, more than 95% of survivors will have a chronic health problem and 80% will have severe or life-threatening conditions.” So in addition to research for treatments and cures, research is needed to help avoid these long term negative effects. To assist in that effort, I have joined the St. Baldrick’s Foundation as a “shavee”. On March 4th, 2017, I will be joining other volunteers at McMullan’s Irish Pub and getting my head shaved. I have until March 4th to reach my donation goal, please consider making a contribution in honor of Michael and every one of the kids across the world fighting for their lives against cancer.